Hippos weigh up to 1,600 pounds, making the semi-aquatic animals the third largest land mammals behind elephants and rhinos. Hippos are herbivores, so they eat mostly plant food to fuel their large frames. Grasses and fallen fruit make up the diets of wild hippos, while hippos who live in zoos usually dine on vegetables and brush. 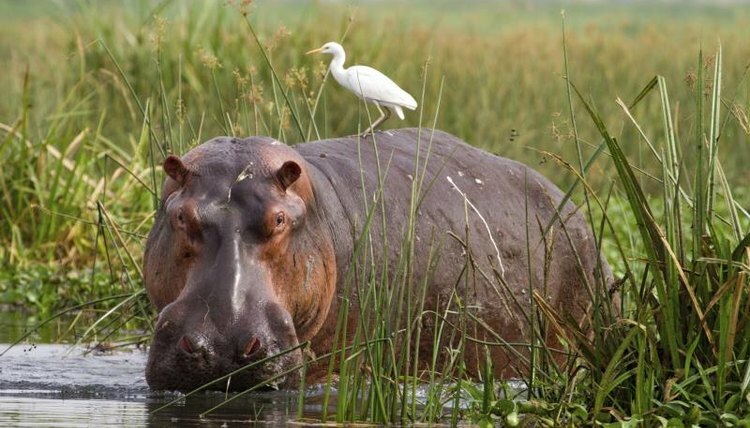 Hippos prefer to graze on grass close to water beds. Because of the shape of their teeth, they seek out short, cropped patches of vegetation that is easily chewed. They may walk up to 6 miles or five hours in a loop overnight to find and devour the right stuff. They may consume fruit if happens to fall on the ground. With their sharp hearing, they can hear the sound of dropping fruit. In captivity, a hippo eats a combination of plants -- including hay, alfalfa and lettuce. On special occasions, hippos may get pumpkins or melons as a treat. Zoos provide hippos and other herbivores with special vegetarian pellets that fulfill their nutritional needs. Hippos don't move a lot during the day, so they consume just 88 pounds of food per night. This may sound like a lot, but when you compare it with their size, it comes out to just 1 percent or 1.5 percent of the individual hippo's body weight. In comparison, the largest cattle eat 2.5 percent of their body weight daily. On rare occasions, hippos in the wild will eat meat or insects. Usually this is due to scarcity of the grasses, vegetation and fruit that makes up their regular diet, such as during a drought. Hippos may chew on water plants, but these flora do not make up a significant portion of their diet.